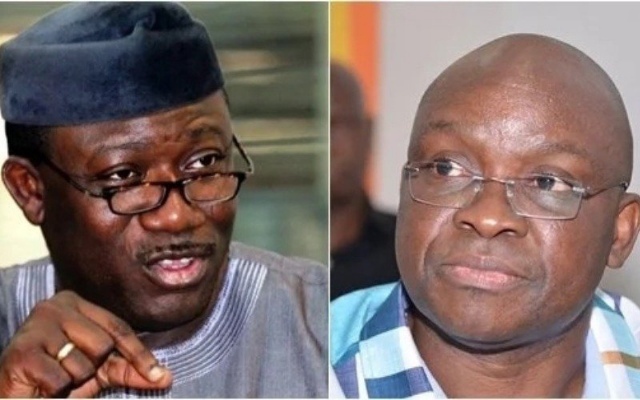 The Kayode Fayemi Campaign Organisation has accused Governor Ayodele Fayose of spreading “irresponsible lies”, saying that lies will not save the governor and his candidate, Prof Olusola Eleka, from defeat in the July 14 governorship poll. Fayose had at the weekend on the state radio accused the All Progressives Congress (APC) governorship candidate, Dr Kayode Fayemi, of planning to compromise INEC in the July 14 poll, saying also that Fayemi planned to ban okada operations and sack workers through competency tests if he wins the governorship election. But reacting on Sunday, Director of Media and Publicity of the Kayode Fayemi Campaign Organisation, Wole Olujobi, said Fayose’s lies will not save him from defeat, as “Ekiti people were done with a fraudulent and callous administration that manipulates the people always for selfish motives”. He said: “Fayose is haunted by his past when he criminally manipulated INEC to win 2014 election as revealed in Captain Sagir Koli audio tape where Fayose himself was heard talking about how he collected INEC sensitive materials he said he printing, including talking about how the results of the election of June 21 was collated in Efon-Alaaye on June 19, two days before the election and as was corroborated by PDP State Secretary, Tope Aluko, in his testimony to the security agencies. “Fayemi never plans to sack okada operators as he always insists, instead, he will strengthen their operations like he once did when he bought over 150 motorcycles and helmets for Okada Association Cooperative Society to improve their living conditions. Olujobi berated Fayose for always employing lies to achieve the “ignoble objective of robbing Ekiti people all the time and at all times”. Describing the governor as a man in need of salvation from leading a life of lies, Fayemi’s spokesman explained: “The only thing that Nigerians and indeed peoples of the world must believe in Fayose is when they see him breathing, which is the evidence that he is still living; everything else is fake and lies. “Fayose’s show of shame as a pathological liar at the Ado Ekiti High Court hearing of a libel suit he filed against Femi Falana (SAN) and TheNews magazine in 2006 over alleged defamation of character typifies the life of lies he leads. “In the open court during cross-examination, Fayose recklessly lied and lied so much that the presiding Judge, Justice Ayodeji Daramola, who is now the Chief Judge of the state, and all the counsel in the court, including Fayose’s lawyers, were watching and shaking their heads in disbelief as Fayose lied and lied so much that he was also contradicting himself. “During judgement, Justice Daramola told Fayose that he was an incorrigible liar, as he was found to be lying throughout the cross-examination, and consequently, the judge dismissed the case, telling Fayose that he had no integrity to protect. “Fayose, about 60 years old and grandfather, lied for more than a year denying that he ever collected N2b Ecological Fund and monthly N1.3b Budget Support Facility for 13 months. “In the case of the N2b ecological fund, Fayose never owned up collecting the money until he got information that APC planned to approach the Ecological Fund office in Abuja for confirmation. “The same week he owned up, he announced Ecological project contract totalling exactly N2b, even though up till now, there is no evidence of ecological project anywhere in the state, as floods ravaged the state early in April. “As for the budget support fund he collected to pay workers salary, for long, Fayose denied collecting the facility until the Federal Government published the figures, the same way he denied borrowing one naira until DMO published the states’ debts showing that Fayose had borrowed N56b between 2014 and 2018. Describing Fayose as the Pharaoh in the life of Ekiti people, Olujobi said Ekiti people were set to return from Egypt, “and there is no amount of lies that will make them vote for Prof Olusola Eleka who the governor is propping to sustain his continuity agenda for mass poverty while Fayose and his family enjoy the life of bliss”.